Marco Specialty Steel is a premier supplier and fabricator of bar grating products. We stock a full line of products that include bar grating accessories. Bar grating needs to be securely fastened in place either by welding or fasteners, sometimes both. See our list below of bar grating accessories to help you figure out whats best for your application. When the grating is designed to be removable or when welding is not practical, consider these mechanical fasteners. The minimum fastener spacing for pedestrian applications is equal to the minimum weld pattern illustrated below. The saddle clip bridges two bearing bars and is attached with 1/4″ self-tapping bolt, 1/4″ self threader, 1/4″ weld stud or 1/4″ bolt and nut when hole is drilled through supporting flange. Available for 15/16″, 1-3/16″ and 1-3/8″ bearing bar spacings (15, 19 and 22 space) in carbon and stainless steel. Fasteners should be specified separate from clips. 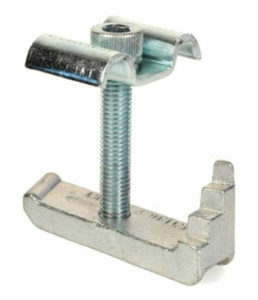 (Fasteners available in Self tapping, or Bolts with nuts and washers included). Fastens grating to a horizontal-facing steel structural member edge. The model GG- describes an assembly of fastener parts identical but for materials of construction, that each contain three common parts. First is a G-Clips unique top for better holding strength and to suit 19W4 grating. Second, a G-Clips patented bottom connects to the beam underside. A hex-headed cap screw connects the two, and its length suits the grating height being installed. The Type GF Grate-Fast Fastener enables rapid and secure connection of open grate flooring to steel sections. 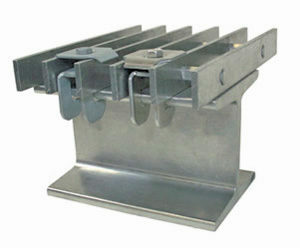 Grating can be connected by one man only, working from above, without the need to drill the steel, or weld on site. 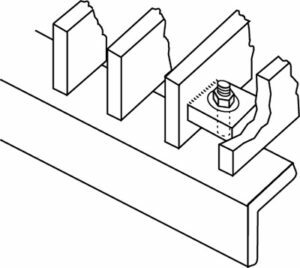 The standard product (LGF037) consists of a pre-assembled top-hat bracket, socket head cap screw and body casting and provides the additional benefit of increased clamping force over lower quality clips. For specific applications, it can be supplied with an off-set top-hat bracket (see option 2) to accommodate non-standard grating bars. The most versatile clip anchor available is the Z Clip. These clips are especially helpful in holding down riveted grating. Z Clips are manufactured from stainless steel and are available in 1(1 and 1-1/4 grating) 1-1/2 (1-1/2 and 1-3/4 grating) and 2(2, 2-1/4 and 2-1/2 grating) with a pre-punched hole to accept a 1/4 bolt or TEK screw. 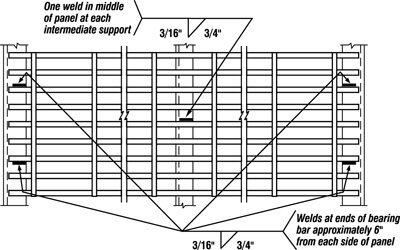 Weld lugs may be used for installations where grating is subject to removal. 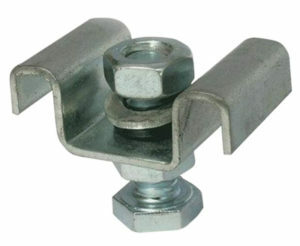 Weld lugs are shop fabricated and must be specified at time of grating order. Fasteners are 1/4 minimum and supplied by others. Location is the same as Attachment Locations diagram. When bar grating needs to be a permanent installation, fasten bar grating in place by securing welding panels to the supporting structure. The diagram below shows the recommended minimum weld size and spacing for pedestrian applications. Applications where there will be vehicular traffic usually require additional welding, size and spacing as determined by the specifying authority. Attachments should be placed at intermediate supports in the middle of the panels and at four bearing bar ends, 6 from each side of panel. Welds should be 3/16 fillet welds, 3/4 long. Heavy-Duty grating may require additional welding to meet application needs. Click here to download a printable PDF file showing attachment locations. Why Choose Marco Specialty Steel for Your Bar Grating Accessories? Marco Specialty Steel has an unrivaled track record dating back to 1992 for providing fast, cost-effective metal and steel product solutions. Since the beginning, our goal has been to provide our customers with high-quality products backed by the best service and support in our industry. Our modern 35,000-square-foot facility, located in Houston, TX, enables us to carry an extensive product inventory — and that means fast delivery to your facility. We also have a complete in-house fabrication shop where we can customize any of our stock products to meet virtually any customer requirement. We invite you to contact our knowledgeable sales staff to learn more about our selection of bar grating clips and fasteners. We can also assist you in selecting the right product for your applications and provide a no-obligation quote. Make Marco Specialty Steel your choice for all your metal product needs!